The series, which ran on Cartoon Network from 2005-2006 for 39 episodes, featured the adventures of Krypto, Superman’s pet dog while he was a toddler on Krypton. Similar to his comics’ origin, Krypto was sent up in space in a test rocket built by Superman’s father, Jor-El, as a preliminary to sending his son into space. However, Krypto’s rocket got knocked off-course. The rocket, with Krypto in suspended animation, arrived on Earth many years later. Like anyone else from Krypton under a yellow sun, Krypto gained the usual array of Kryptonian superpowers (albeit a dog-sized version). A suburban Metropolis boy named Kevin eventually adopts Krypto. Via a universal translator build by Jor-El, Kevin’s able to speak to Krypto and the other animals in the series. Krypto’s personality is similar to Superman’s (being noble, kind, etc.). He still has a dog’s sensibilities, such as enjoying playing fetch. Andrea is Kevin’s next-door neighbor, and also in Kevin’s class at school. Andrea’s also the owner of a pet cat named Streaky. 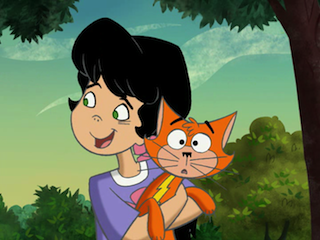 (In the comics, Streaky’s usually been Supergirl’s pet cat.) Like his comic counterpart, Streaky gained powers similar to Krypto’s during an early adventure. Streaky often accompanies Krypto on missions, albeit reluctantly—he’s still a cat, after all. Andrea (pronounced “Ahn-dray-uh,” as she notes to Kevin in the pilot) seems somewhat more extroverted than Kevin. An example of this is in an episode where the two (via Krypto and Red Kryptonite) briefly gain superpowers and become (at her urging) superheroes. Andrea’s other interests include pampering Streaky and dressing him up in various play-clothes. Most of the early episodes involved Kevin and Krypto trying to hide Krypto’s secret from Andrea. However, she eventually finds out, as seen in the episode appropriately titled “Andrea Finds Out.” Andrea even gets her own communicator that lets her speak to Krypto and Streaky. The series finale episode “Iguanukkah” revealed Andrea’s Jewish. In this episode, Andrea shows Kevin, Krypto, and Streaky how she celebrates Hanukkah, as well as the story behind the holiday’s origins. Later, Andrea shows some kindness and also invites Ignatius, Lex Luthor’s pet iguana in this series. Unlike Lex, Ignatius is too self-absorbed and bumbling to be a true villain. He’s more of a nuisance to Krypto.